Tuesday Governor Rick Snyder delivered a State of the State address that was unusual compared to his previous addresses, focusing less on accomplishments and more on the failures that led to the Flint water crisis. For the past several months, the Michigan governor has been at the forefront of harsh criticism for how he handled the Flint situation. Snyder addressed the problem in his speech, calling it a failure not only on his part, but a failure on all levels of government. Snyder was adamant that he is going to do everything he can to fix this issue in the short term and the long term. “We are absolutely committed to taking the right steps to effectively solve this crisis,” Snyder said. Snyder also said he would post all of his emails from 2014 to 2015 concerning everything that dealt with the Flint water crisis. Michigan is one of only two states, along with Massachusetts, which shields its governor from Freedom of Information Act requests. The governor has requested $28 million in additional funds from the state legislature to buy additional bottled water, lead filters, provide additional testing for high risk locations such as schools and daycare centers, treatment of children who have tested positive for high levels of lead and an infrastructure integrity study to fix the pipes and other connections. According to Snyder, Michigan’s overall infrastructure was given a “D” rank by the American Society of Civil Engineers. The crisis in Flint began in spring of 2013 when it was under the authority of an emergency manager appointed by the state. The decision was made to switch over from the Detroit water system, to the Flint River a year later, in order to save money. Throughout 2014 and 2015, reports of lead contamination were made about the water quality in Flint. 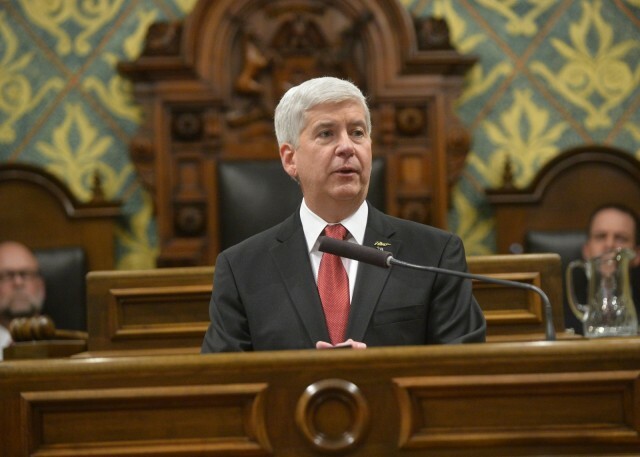 Snyder declared a state of emergency in Flint Jan. 5, and a federal state of emergency was declared Jan. 16. The governor’s office came under fire starting last month when national media began covering the story. Earlier this month, both the state attorney’s office and the federal justice department opened investigations into the matter. If you would like to aid Flint, visit HelpforFlint.com to volunteer or donate.